What Is Normalized Factor Return? A normalized factor return is a standardization of a factor return index that uses several Savitzky-Golay filters to provide indicators on the short-term and longer-term levels of the factor return index. The final score is calculated by applying a standardized Z-Score on the difference between the short-term (101 day data sample) and longer-term filters (252 trading day mean and std data sample). A factor is defined as “overbought” or “oversold” if its normalized factor return is greater than 1 or -1, respectively. A factor is defined as “extremely overbought” or “extremely oversold” if its normalized factor return is greater than 2 or -2, respectively. 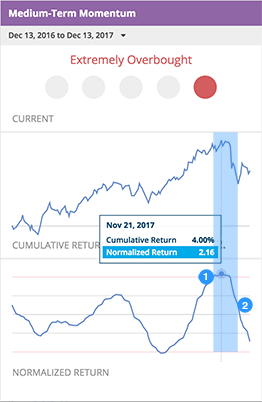 Historically, when looking ahead to the next quarter of trading, an extremely overbought or oversold factor tends to revert to its long-term return trend more than 70% of the time. A reversion to the long-term return trend is defined as the normalized factor return moving from its current extremely overbought or oversold levels (i.e. greater than 2 standard deviations) to within 0.5 standard deviations of the long-term trend for at least 5 trading days within the selected period. The factor hit extreme overbought levels (+2.00) on November 15, 2017 and peaked at a normalized return of +2.16 on November 21st, 2017. Subsequently, the factor reverted to +0.5 standard deviations by December 4th, 2017.